Sonny Dykes' record against USC, UCLA and Stanford is ugly. 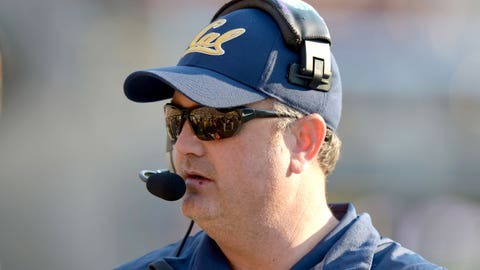 Cal head coach Sonny Dykes is having a rough go against other Pac-12 teams from California. After losing to UCLA on Thursday night in Los Angeles, Dykes is 0-7 against UCLA, USC and Stanford. With the loss to the Bruins, Dykes is also 0-3 as Cal’s head coach following a bye week. Sonny Dykes about to go to 0-7 against the California schools and 0-3 following a bye week. Dykes and the Bears will have another chance to beat a California rival next week when the Trojans come to Berkeley on Halloween.